Car Boot- Forget it & Reubenesque clothes. Sunday. I worked hard at answering mail this morning since Mike had mentioned maybe going to a car boot if we were up early enough. I wasn’t sure which Country they held them in an afternoon but I held out high hopes. I held them out so long my arms were very tired. When I went through at 8.00 am I put the makings of one of the new barista style coffees in his cup and boiled a kettle ready. ( Sorry Kenco, no free adverts, but maybe some more of your wonderful Millicano? Damn). I went back and got washed and dressed to save clashes in the bathroom and settled down to answer a few more messages and comments on last night’s blog . I kept refreshing and answering, refreshing and answering until finally he surfaced at 10.50 am. The first thing he said ” How could you let me sleep so long it’s nearly lunchtime?” Erm, actually I’d noticed. Mike told me I’d been snoring away last night when he was reading the blog. Now we’ve mastered words I must teach him to follow sentences as he’d been reading it before I went to bed and I had almost an hour’s read once I got there. I know my blogs are long but……….. Anyway, lunch time soon came around and before we left the house at about 12.45 pm Mike gave me the choice of where to go. I didn’t want a beef dinner, who was that just fainted with shock, come on girl, on your feet again. I’d had the Sunday dinner yesterday so I elected to go to the Ivy Emporium again since last visit was just coffee. He didn’t demur so I stuck chocolates in my pocket and off we went. It was quite busy traffic today and I think the caravanners are coming down at the weekends now. The Ivy was fairly busy too which was nice but our usual table was empty and Tariq made a point of coming to say hello. We settled in our seats and Helen ( Mad Cat Lady) detoured by our table to say hi too. Tariq came to take our order. I chose ( look away now all you who are on diets or get jealous easily) lambs liver in a thick onion gravy with a baked potato and minted mushy peas. Mike chose pork and leek sausages, mustard mash and peas. We both had coffee, his Americano, mine latte. I even remembered to bring my tablets out and to take them. The meals were delicious, Mike practically wiped the pattern from the plate. When Tariq came to ask if we’d enjoyed the meal Mike said ” Terrible food. just awful, I only ate it as a courtesy.” Tariq burst into his usual laughter. I had the usual row at the counter about paying, then OK a discount then, followed by , well at least have the coffees. I settled for paying the whole bill and for yesterday’s drinks. I don’t want to be responsible for them going kaput and disappearing from our lives. We had a chat with Tariq, Shella and Helen before leaving and Mike told Shella how she needed to improve her cooking, he did have a huge grin on his face though. We headed home where Mike dropped me off and continued his journey over to his Dad’s. He reminded me about the optician on Friday and said he’s be here to take me and might even come on Thursday night. I waved him off and came straight in to work on my emails. At 5.30 I knocked off for tea which was ( to my shame) half a rhubarb pie with some evaporated milk. I watched a halfway decent film, a true story, afterwards and retired to my room just after 8.00pm where I’ve now caught up with mail and done today’s blog piece. I hope you’ve all had a great weekend. Monday. No-one around this morning so I paced myself with mail despite there being 104, I knew I had time. No cons today and no offers of marriage either, I’m refusing to call those a con as it would deflate my fragile ego. Someone already suggested Reuben was handsome so he couldn’t have got it from me, oh yes, that was me wasn’t it. I had my usual break around 8.00 am to see to the fish and partake of my drugs which stop me being anxious but lets face it, you lot scare me to death anyway. At 9.30 am I washed, dressed and headed out to the chemist with a repeat prescription request. On Wednesday there’ll be a knock on the door and everything will be delivered. I also picked up a get well card this morning and then came home to write it. I wrote to Sheryl how all my wonderful friends around the world had offered prayers or best wishes for her recovery. I caught up with my emails about 11.15 am and decided to take the card to Sheryl’s mum who is a close neighbour. She’s a lovely lady. I was prepared to lie about the reason for leaving a card with her in case the family hadn’t told her the news but as I asked if I could leave it she said “Oh, you’ve heard” and invited me in. We were talking together and she started to tell me the story of how the growth had been discovered. Then she went on to tell me that she lost her eldest son to cancer some years ago, then her youngest son to cancer three years later then four years ago her middle son was also diagnosed with it. He lives in Germany and has had a treatment I’ve never heard of but which sounds really radical and has left him with a tube under his arm to help him breathe? Anyway it sounds like he’s been told he can wait a year before attending again so maybe he’s in remission. I can’t wait for the same news about Sheryl. She was delighted when I said I’d blogged about her daughter, at least after I explained what a blog was. Tuesday. I was up at two for a wee and once I’d had a ciggie knew I could manage some more sleep. That lasted till 4.00 am when more sleep was off the menu. I got up. There were 122 messages waiting for me and I wasn’t very happy. I started. By 7.30 am they were almost done but knowing if I had the courage to take the bus I needed to be dressed I began the rituals early. The fish didn’t complain. When I was prepared I finished off the rest of the mail and logged out. At 8.00 am I left for the bus. The bus stop was filled with kids going to school but I hung on knowing they wouldn’t be taking my bus. At the appointed time the school bus drew up short of the stop and I was trampled by the herd of wildebeest trying to board. My bus arrived and drew up behind the school bus so I extricated myself and got on. I was carrying a bag and the driver didn’t lower the bus so getting on was a slight struggle but once there I found the single seat for disabled was unoccupied and I was sure I wouldn’t be disturbed there. At the next stop a man got on and looking at me said “Hey man how are you?” My mouth was opening and closing like a goldfish and my heart was pumping but an answer came from just behind me and I realised he had an unfortunate squint. I texted Yvonne to say I was aboard and expected to be there at 9.30 am ‘ish’ an she said she’d meet the bus. When I arrived in Chester we went for a coffee. Reuben was asleep and stayed that way while I showed his mum the rug, wooden board games, her bedding and most importantly Reuben’s book. She almost squealed, but from pleasure. She liked it. First hurdle over. We went to a shop to look at baby clothes and I got a few nice things for Reuben. I also needed to check on a watch winder for Mike at a jewellers. As time was moving on a bit we decided to have a slightly early lunch and headed for Spud U Like where we both had baked potatoes and beans. I say both when I should say all because wide awake Reuben decided he wanted some and set his verbal siren going until Yvonne obliged him. It turns out he likes potatoes and beans. From there we went to get some food from Tesco for Yvonne’s Slimming World diet which she started this weekend. It’s mainly vegetables and fruit it seems with a few ‘sins’allowed. We left through the back door of Tesco after I’d found some more Reubenesque clothes. I did pay honestly. Yvonne wanted to show me another way to their home. What a pretty but pretty convoluted path. I’m normally a -show me once and I’ll find my way again- type of guy but not this time.From now on I’ll leave the short cut to her and take the long cut when I’m alone. I played with Reuben while Yvonne made a bottle but as she fed him she put Philadelphia on for me. It’s a long time since I’ve seen it. I must have seen every other two minutes of the plot though as I kept nodding off upright and then waking up as I snored. Yvonne was highly amused. Luckily I was asleep again before I had chance to be embarrassed. When my antique road trip came on I fought really hard but I don’t think I succeeded. Ugo came home as my programme ended and it was time to get ready to be taken home. I realised we were going home while it was still light at 5.30 pm whereas last time it seemed to be pitch black. As we got to the village Ugo nipped to the chippy for himself and me. Yvonne had a salad with her. At home I buttered a couple of baps but the bread was crumbling everywhere. I made a right mess but salvaged enough to enjoy chip butties. Ugo had his kebab and chips, Yvonne her salad and Reuben just refused to eat his tea at first until he’s had a yoghurt then he was no problem. Ugo had a leftover Christmas pudding and I had a wagonwheel which I had to share with Reuben. He had no problems with that. They left around 8.00 pm and I got my exercise carrying baby(elephant) to the car, then I came and logged on again to find 169 waiting. So, I’ve been hard at it since then and have broken off to do the blog before going back to make a determined effort. Night all. Wednesday. Getting up at four wasn’t much of a problem today as I’d hardly been in bed anyway. I had a case of King Edward’s Revenge in that I must have eaten a bad chip last night. The loo seat didn’t have time to get cold. Every time I lay down I needed to get up again so I decided I might as well stay up and work. Probably just as well I did. You know when you comment on a blog you can tick to say ‘let me know if there are further comments on this blog’? Well right now I wish I could take those ticks back as I’m being swamped. I can’t refresh my mailbox and get less than 100. At 7.30 am I texted MuJo and asked if we could postpone the day as I’m shattered. I’d just gone through to the kitchen to start the routine when I got an answer saying it was fine and they hoped to see me soon. I put my phone on charge as I was there. At about 9.30 am I was feeling confident that there wouldn’t be another dash so I dressed quickly and went to the chemist for something for my tummy and the drugs they’d tried to deliver yesterday when I was out. I made it back to the house safely. There was a text from Yvonne to say the Gas Board have agreed to move my meter to a better position to be read and they’re doing it tomorrow afternoon. Now I have joy and trepidation in equal measure. Joy they’re coming, trepidation there’s only me here. Can I open the door to them or not? I worked up to lunchtime then had a bite to eat while I watched TV. There wasn’t much on so I went straight back through. I’d been out an hour and there were 87 which shows I was lying about what happens when I refresh. I worked most of the afternoon but went through at 4.00 pm ready for my Antiques Road Trip at 4.30 pm. I immediately fell asleep and only woke for the last quarter hour. Beggar that I thought and had a quiz too. Just before 6.00 pm I glanced out of the window and saw Dil and Matt approach so I went to make drinks. No sign of Lee. They we’re both on form as we played scrabble with Dil doubting all Matt’s words ( in jest) and Matt having to bring them up on his ipad and have someone say them out loud. She must be a very tiny lady in there. The insults were flying so thick and fast it was like a snowstorm or maybe that was just my dandruff from laughing. Matt won. Before we started the next game I nipped to check my phone and found I’d missed a message from Lee to say he couldn’t make it this week. I think I’d guessed. Second game was Nomination whist which started off OK with Dill a little ahead and me scoring as usual. Matt asked for some paper to record the order the suits are played in so quick as a flash I handed over the score pad and suggested he could follow them on there……..of course he’d have to score though. He accepted which cheered Dil as he said at least I couldn’t cheat now. True enough, but with Matt’s help I still went on to win. Thanks Matt, I’ll pay you next week. Before we started again I made fresh drinks and let them decide on the next game. By the time I came back in the cribbage board was out and Dil was dealing. I noticed a definite pattern, On Dil’s deal he got a great hand and box, on mine I got an anagram of carp and Matt’s wasn’t much better. Dil gets a twelve point hand and an eight point box, I get two, Matt get’s six. My deal, I get a four point hand and a nil box, on Matt’s deal an eight point hand and a two point box. The next round Dil is round the corner on his second street while I’m not halfway up the first. Next week I’m checking his sleeves. At 9.30 it’s time for them to leave. Honours even tonight, we all said Thanks and see you next week. My Wednesday evenings are a real highlight despite all the insults. Wash the pots, take tabs, straighten settee and straight through to start work on the 139 waiting this time round. One very upsetting one from my friend Lis, her daughter ( beloved Charlie) has a friend diagnosed with pancreatic cancer and he’s in a lot of pain. Lis is asking for the name of the surgeon who did Ju’s splanchnicectomy. What a hideous disease cancer is, especially this one. How indiscriminate it is as to who and where it strikes. It’s almost 12 months since my precious Ju sied from this. My books don’t sell enough to make a difference, but if I ever win the lottery……………………..12.23am and they’re all done. Hallelujah. Just the blog now and I can go to bed. Good morning everybody. Hugs . Thursday. Today will be short to prevent you suffering the boredom I suffered. Needless to say I worked all morning apart from a quarter hour venture to the post office and the corner shop. I lunched on 2 ham baps with branston pickle. The Gas Board were due between 1.00 pm and 4.00 pm but did not turn up. Yvonne rang and whoever she spoke to today wouldn’t give any info because of the Data Protection Act, despite having an email from me asking them to deal with her. She asked quite reasonably why in that case did a member of staff break the DPA yesterday in speaking to her. They backed down a bit hen admitted no appointment had been made yesterday for this afternoon. I sense the fumes coming off her now. It seems in my state of health and age I should not be reading the meter, it’s the job of the meter readers. That’s fine but goes straight back to my argument that when they see where it is and how difficult it is to get at, they’re quite happy for me to lie on the floor , bent round a corner trying to read it. Anyway, they only read it twice a year and estimate twice. If I disagree with the estimates I have to read it to give the correct figures. So, they don’t move the meters now because it’s awkward, I just have to give up reading them………except, if the gas tap is down by the meter they can move it then so it’s not hard for me to turn it of in an emergency. Guess where the gas tap is ! They’d have found that out if they’d come and inspected today, but only if someone had bothered to really make an appointment. AAAAaaarrgh… I have emailed a complaint. From 4.30 to 8.00 I sat in front of the box having an angina attack after having moved everything back into the room where the meter is. That includes one very heavy table. Then I decided to come back through and face you all again. Let your posts and your mail lift me like written Red Bull. Thank you. Nite Nite all. Friday. Early start, as usual plenty of mail. I just kept chugging away until a quarter to eight when I’d finished round one and could go see to the fish. Once I’d tapped enough snails off the side of the tank to see the fish I could see they were enjoying breakfast so I made my coffee, took my tabs etc and wandered back to the bedroom. In my absence which was less than half an hour another 39 messages had appeared.I was under no pressure so I took my time and only wavered when the postie delivered a letter addressed to Ju and myself. That caught me a little unawares. She’s obviously on my mind a lot at the moment as it will be a year at the end of the month. I’m sure it will be worse for Yvonne as the anniversary is Mother’s Day in the UK. Are you ready for this?………I got washed and dressed about 11.00 am, how decadent it that. I’d not long since had a message from Mike to say he was on his way and I was afraid if there were no traffic police about he’d use his boosters to reach warp speed and be here before he’d left there. It’s going to happen one day. As it happened he was quite good and arrived about 12.45 pm which was almost, barely, legal (ish). I was up to date with the mail and just relaxing in the lounge. Not for long though. I made his coffee and we chatted about blood tests for cholesterol he must have since his doctor has decided his heart is OK but accepts there are other problems. The day he was supposed to go he ‘forgot’ and had two coffee’s though the blood test is a fasting one. I’m just waiting for the next time he has the nerve to have a go at me. We went to Kassidy’s for lunch so I could take tabs and eat. Timing was perfect as it was roast beef today. We saw Chris cooking and waved to her but she was really busy. From there we headed to Flint ready for my optician’s appointment at 3.10 pm. There was time to take a slow walk around town and look in a few shops before making our way to the appointment. Mike did all my talking for me and I swear they either think I’m dumb or that he’s my keeper. He’s happy to offer either or both explanations but during they eye test I had no choice but to stutter an occasional answer. Mainly I tried to get away with just using fingers which became a slight problem when indicating two. In the end I didn’t require a change of prescription though at some stage I may have some new frames put round my existing lenses. Looking at a copy of the prescription at the end though I was quite surprised at the difference between my eyes. It’s so distinct that I think I’m wearing one of someone else’s. We walked back to where we’d parked and drove down to Temptations for a coffee. Some nameless person on my table had a toffee and apple loaf and bear in mind I dislike cooked apples. Ceri wasn’t in so the boss Daniel served us. Nice chap with a great singing voice like his brothers. Home again Mike sat in front of the box while I caught up on mail again until 4.30 when it was the last of my week’s Antique Road Trips. No sooner had it started than Mike was asleep in the chair. He woke up again in time for a quiz or two and then at 7.00 pm he washed my hair and I took a shower. We saw the next episode of the new Jonathan Creek and though a little better than last week ( for me) I wouldn’t go out of my way for it as I did when buying videos of the original series. Once over I’m back in here finishing my mail and getting to the blog. Early shopping tomorrow and you never know, Mr. Reluctant may actually get up without his alarm clock and my prompting. Ha Ha Ha, I usually wait until I’m asleep to have unrealistic dreams. See you tomorrow folks. Saturday. My favorite day of the week started at 5.25 today. Not too bad compared to some days and certainly early enough to allow me to clear my postbox in time for 7.00 am. The post seems to be settling down a bit again so it wasn’t a whimper of despair issuing forth from my room it was more a slight hiccup of delight. I was in the kitchen and had dealt with the light in the tank and had taken my tabs when Mike’s alarm went off. It seemed to go on a little longer than usual but that’s possibly because it seemed to have moved just beyond his grasp. But, it did stop so I thought maybe he was up. Colour me stupid. I carried his coffee through and he’d rolled over and covered his head with the covers. I caught his attention with the megaphone announcing coffee but he still fought an actual move. I went to get my coffee. At 7.40 am I’d caught up again and had read a few interesting posts. I went to check on Mike and though he was still lying down he was actually awake and drinking his drink. “Drink your drink” I told him, hoping he’d get a move on. Colour me hysterical now laughing at my own joke. We did actually get out of the house at 8.10 am by which time I’d sorted all the rubbish for the bin men and smoked enough cigarettes to add to it. As we were travelling Mike told me that his lovely daughter Lisa and grandson Alex may be visiting us this afternoon but just a flying visit as she returns to Poland tomorrow. Great, I haven’t seen them in ages. The shopping didn’t take too long but by the time we finished I was wearing three sets of earmuffs to try and deafen myself to his voice. ” Why do we need so many biscuits” he asked. ” Because we’re having visitors and I wan’t a variety” I answered without sinking an axe in his skull. “You know you can’t have them” said he, “Shut tha’ gob” I thought, “Yes Michael” I said. We headed for Flint and while Mike headed for Temptations in the car to canoodle with Ceri, I walked over from Homies where I met someone I knew. Unfortunately he didn’t know about Ju and asked after her health. Oops, I couldn’t say “It’s not too good” and had to say I’d lost her. The tears in the eyes were mirrored. Eventually Mike came looking for me. The canoodling wasn’t over but he wanted his coffee and I was holding matters up. I excused myself and we headed back over. I got my hug from Ceri and how nice it was. Leaving there Mike used his phone in the car to ring Lisa and suggest as she was short on time, instead of visiting us, how about we met her for a drink in Colwyn Bay after they’d visited with her mother. That was agreed as a good idea. So, we unpacked the shopping at home and at just gone 12.00 pm gathered some sweets and headed for lunch at the Ivy. There was nothing on the specials board that appealed today so we were going to settle for a breakfast. On the off chance I asked Tariq when they’d next be having the wonderful ham I’d had a couple of weeks ago. As luck would have it some had been prepared for tomorrow and he offered to do ham, egg, chips and peas which we both agreed to straight away. It was even better than last time. We didn’t get as much chance to chat with Tariq and the girls as usual so we left while they fought over who got what out of the sweets. Somehow I doubt Tariq won. We arrived in Colwyn Bay and met up in Costa. Mike cried and wanted to go to the cafe next door ( where they don’t burn the coffee he says) but I put my foot down with a firm hand and gave him money to go to the counter. I was watching to make sure I got my change as he tried to steal a penny from me this morning. The depths to which some people will sink. An amazing coincidence is that when we arrived Lisa was talking to a friend of hers.This young lady is just moving to Yvonne’s previous address in Chester. Anyway we had a good hour and a half with them, poor Alex must have been bored with adult chatter and he ended up playing games on a phone though I did take one of Reuben’s books for Lisa to read with him. Just before we left the precinct I bought sandwiches for tea to save me messing about when I got in. We went our separate ways and Mike drove us home again all the time wondering why he din’t catch up to Lisa on the expressway. He suggested she must be driving like a bat out of hell. I wonder where she got that from then. At home we settled to me on the computer for an hour and Mike playing computer games. When I’d done I went through and plated up our tea, got cakes out that I’d bought this morning and carefully hid the biscuits so he forgot about them. We watched a film with Zac Efron which was really quite good and then started on Endeavor which is the Series about Morse as a young policeman. Excellent series. Time to catch up on the last of the mail and to say hello to you with the blog. I hope you all have a Great New Week and I send Hugs Unlimited. Thanks Ardys, it seems much more prevalent these days and nothing seems t stop it. We do need to enjoy the moment while we can whilst offering support to our friends that need it. Thanks for the tip about “Endeavor.” I had saved it on Netflix but haven’t watched it. David, I’m wishing you and yours a wonderful new week. Ha Ha, or an Errol Flynn maybe? He didn’t like the dummy before but seems to be happy now, pass the boy a mirror. You may not warm to Morse jnr. at first, but persevere if you can. It’s a case of being dragged kicking and screaming out of the house Lori. The moustache rivals my own. ha ha. I know I’m a little slow, but I just realised you have your main meal at lunch time. Do you actually slave over a hot stove? Or are these pre-prepared meals? Re the gas meter, have you tried sending the company a registered letter? It has real advantages when dealing with corporates – they have to sign for it so can’t deny receiving it, and then the letter becomes part of the audit trail on your account. If say, you slipped and broke something while trying to read the existing meter, you could probably sue them for negligence. Even if you never dreamt of suing them, the mere fact that you /could/ is often enough to trigger action. Pre-prepared meals as separate items Andrea. The hardest part is opening a tin of veg. The standing joke here is to call my cooker ‘The Library’ because I once stood a row of cookbooks on it while clearing a space for them. I haven’t sent the Gas Company a letter before now as it’s only recently that the problem of doing readings correctly has become a problem. I wanted o see what result the emails have first but a registered letter is my next move.I may not be able to talk to them but they’ll feel the wrath of my pen if they don’t make a move. Maybe I should buy him an electric razor for his birthday just in case it grows any more. Shh, don’t mention the biscuits yet, it’s half an hour before Mike leaves. Great idea, I could even allow him to shave me with that. Good to know your book got a great reception. I hope the week goes well, you don’t find any more off-chips on your way… and e-mails behave. Thanks so much Olga. I’m sure there won’t be any off-chips this week. If I eat any more of them I’ll be looking like a chip. The emails are getting better every day. Have a wonderful week. We’re all waiting to hear about your change of lifestyle. Hi David. Everyone sleeping so I have piece and quiet to enjoy your post! Tea in one hand and slice of banana cake by my side. Lovely! How exciting that you have been able to give Reuben his book, it must be so lovely to see your hard work finished and have something that can be kept forever. We will be thinking of you in your difficult month, must be hard having something just there in the back of your mind. It’s hard when difficult memories are triggered by time. You reminded me that I have to catch up on Jonathan Creek, glad this episode slighlty better than the first. Think it will be my Sunday night viewing. Really enjoy my Sunday reading of your post’s, so thank you. Two sugars in mine please Kim or to save Mike shouting, two of those fake sugars then. 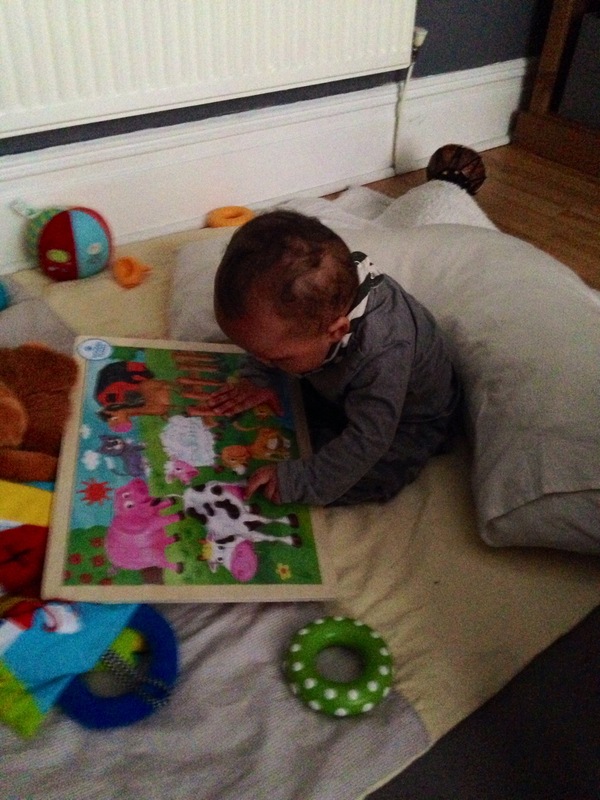 It was nice to have the book there for Reuben though I don’t think it will mean much to him as he gets older. Poems are probably not a boy think once you’ve had the first laugh. I make my own life difficult by choosing this weekend to fill an album with pictures of Ju but I wouldn’t forget her anyway. She was my best friend as well as my wife. I hope you get a bit more pleasure from this episode, I think there was some underlying humour which improved it for me. Thanks so much for keeping in touch. Hello Dear C.J. and Mousie, I’m so sorry you’ve been having such a bad news time. Life sneaks up behind and bites sometimes doesn’t it? I’m sorry about your cousin C.J. lupus is so debilltating. As for the friend, well since that’s what took Ju from me I hope with all my heart something miraculous happens. I’d rather that than ever sell another book. You know, David, as soon as I read “Reubenesque” clothes, I had to see the pictures. I’m still visually hugging the little guy with the fake mustache pacifier, and of course his intent puzzle work while he sits on the blanket. You have a blend of humor and honest but basic statements of difficulties, and for this readers return. We all have that blend, but we just can’t always share it. Hugs! to you and Reuben! I should have perhaps mentioned the ‘puzzle’ is still in it’s wrapper so he can’t put anything in his mouth and it’s just the colours that fascinate him. Thank you for the huge compliment which is great praise coming from someone with a blog like yours. How kind you are Dear Tazein. For once I’m going to say, during this month when my memories keep me mourning my beloved Julia I’m in a bit of a rut and I’d rather you nominated one of those upcoming blogs who shine and deserve such an award. I really don’t think I do at the moment and I wouldn’t want to create another post showing myself as something others are more qualified to be. You have my eternal thanks for your kindness but perhaps you can now brighten someone else’s day as you do mine. Ah yes, we encourage it with a bit of mulch from the rhubarb patch.It’ll be competition size next year. I know I’m showing my lack of British language but what is a car boot show? I thought a car boot was what we in Canada (and I think the States) called a car trunk? Sorry you didn’t get any marriage proposals this week, must be a slow week. 🙂 I love scrabble although I haven’t played it in a while. Sounds like you had a great week. Glad you don’t need stronger glasses, that’s never fun. Take care. Hugs. A car boot is what you’d call the trunk. Every week people drive their cars to a designated place and sell unwanted things, like your garage sales but not at home. I love car boot sales as I get a lot of books there. No marriage proposals, I think they’ve started blowing up my picture now. Most weeks are great weeks Maggie because people are nice. I’m lucky. I’ll have to remember tailgate sales Maggie, I’ve not heard that one before. You’re welcome to the support, I know how difficult it can be to reach a wide audience sometimes. I’m sure you’ll have lots of support on the day- heck, it’s tomorrow !!!! 🙂 Massive hugs to you as well. You sure get up early David. It obviously suits you very well, as it seems you get a lot done first thing. Your blog gets more comments than any other blog I have ever come across! You know what they say about the early bird Guy. I sure am fed up of worms though ! Maybe I’ll feature on WordPress one day for the witty comments I get from everyone but I doubt I get the most by a long shot. The fish are managing to survive Laurie, sometimes in despite of my forgetting food.Luckily they’re used to one day without food a week so now I just pretend I’ve changed the day and hope I remember to feed them on a Saturday instead. I hope I’ve learned my lesson now and won’t ask for follow up comments again. It’s enough to do just coping with my own on Sunday/Monday. Reuben wasn’t interested in the dummy when I first bought it but I reckon someone has shown him some Errol Flynn films since then and he’s gone into training. I didn’t mind when they started tapping the side oft the tank to remind me to feed them until they started doing it with a rock. It made pretty patterns on the glass but is quite worrying. I think yours is a wise solution to my problem. No more ticking boxes. We did a car boot sale once (in Spain). I was amazed that Partner was surprisingly good at it. Better than me and I spent years working on the market. Can’t say I like going to them though, usually full of junk. I’ve got some books to sell at some point. Aren’t you pleased you did your cast list? Well, I am, because I couldn’t remember exactly who Matt and Dil were (or Lee) so I looked them up. I find sometimes that there are little gems at car boot sales and if done from the other side can be nice little earners for something you no longer want. Yes, I’m pleased I followed your advice with the cast list. With my memory, even I have to refer to it. I never expected such terrible language From you, as if I’d ever let Reuben get near my wagon wheels, UNTHINKABLE ! I’m grateful to everybody who shares life’s (mis)adventures with me Jacqueline. Without my friends and my blog posts life would be pretty boring. Please don’t apologise Lottie it’s nice to have you here at anytime. It sounds like you’ve had a busier time than me, I hope that means you’ve both enjoyed yourselves. A lot easier to visit than your previous address. Don’t worry, Reuben will find that picture popping up all over the place when he’s 21. Amazingly I can send you Hugs Galore from a sunny UK this week. Reuben has a mustache. What are you feeding him? 🙂 I’m a little behind catching up here. Your grandson must look forward to your visits. It’s great that you get out so often. Have a great upcoming weekend. I think the easy answer is, since he’s so big ‘Anything he wants’Mary J. I’m starting to believe that he recognises me now. Though I only see him once a week I think the voice must have made an impression. I’m very lucky to get a lot of smiles. Thank you, I’m sure I will. I hope you have a Wonderful Weekend too. Hello Vashti, lovely to have you drop in. Yes, every time I turn round there’s more mail in the box , if I ever catch the Interweb carrier pigeon, heaven help him. 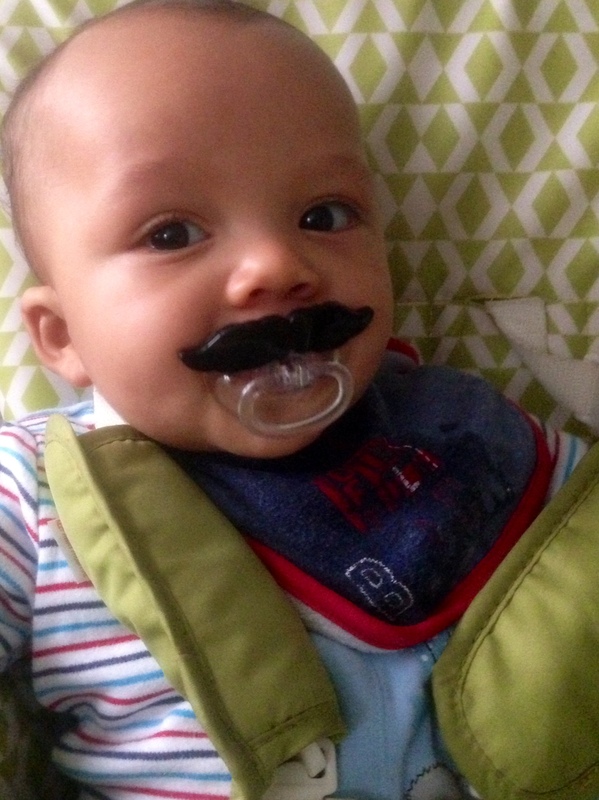 I got the moustache dummy as a joke because he keeps being dressed like me ( Pops) and I have one, a moustache I mean. Trouble is, it doesn’t make him any less cute and I’m jealous. Have a great week.